Well that’s the headline in the Irish Examiner this week….We’re delighted that national media are picking up on the message we’re trying to spread. 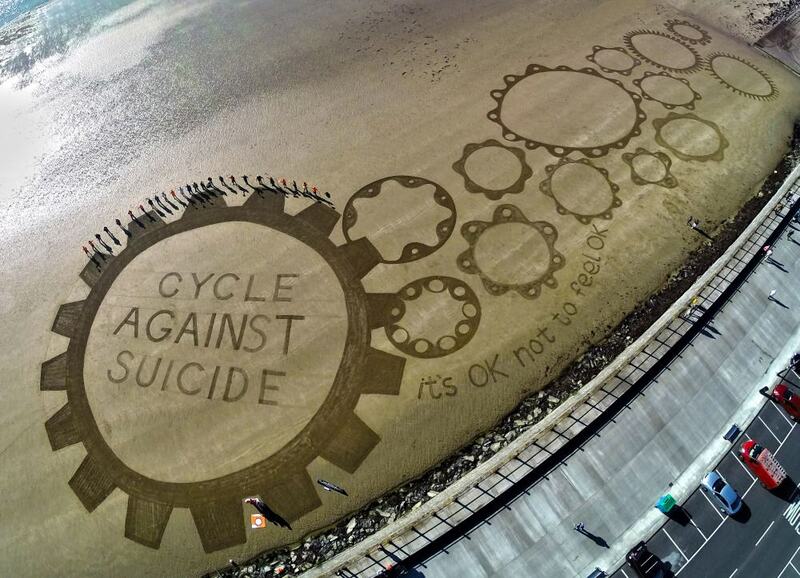 The Waterford artist Sean Corcoran along with 28 volunteers created the drawing on the beach in Tramore to celebrate the great work carried out by Cycle Against Suicide. The temporary artwork in the sand was 300 metres long and took 3 hours to complete before the tide claimed all. The photograph by Mick Malone of Deise Aerial Photography has also made Photo of the Week in the News and Star, has been covered by BreakingNews.ie and has been shared virally across the internet. Sean and his wife Miranda run an art school called The Art Hand which is located at the heart of The Copper Coast in County Waterford. They facilitate projects in Environmental Art, Stained Glass and Mosaic at their custom built facility as well as in the community and in schools around the country. This entry was posted in Beach Art, Sean Corcoran, Waterford and tagged Beach Art, Collaborative Art, Cycle Against Suicide, Deise Aerial Photography, environmental art, Ireland, Landscape, Mick Malone, Sand art, Sean Corcoran, seascape, The Art Hand, The Copper Coast, Tramore, waterford. Bookmark the permalink.